Guava Leaves are Antiseptic, Prevents Hair Loss, Premature Greying, Diabetes, Cholesterol, Allergies, Diarrhea, Weight Loss, Food Poisoning, Dengue, Acne, Black Heads, Tooth Aches, Wounds, Infections. Guava trees are cultivated in many tropical and subtropical regions. Guavas are rich in dietary fiber and vitamin C, with moderate levels of folic acid. They have a low-calorie profile of essential nutrients. A single guava fruit contains about 4 times the amount of vitamin C as an orange and 10 times more than a lemon. Guava seed oil is also used to cure many health ailments. 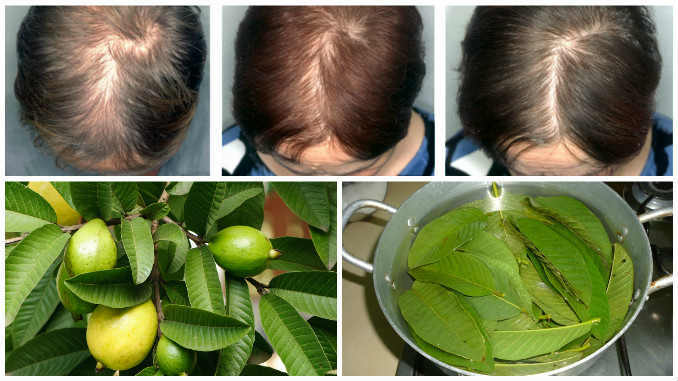 However, Guava Leaves are most neglected, but useful for haircare. Guava leaves are packed with antioxidants, antibacterial and anti-inflammatory agents and beneficial tannins. Guava leaves contain chemicals such as: polyphenols, carotenoids, flavonoids, tannins can be extremely effective in treating various diseases. Vitamin B complex (thiamine, riboflavin, niacin, folate, pantothenic acid, pyridoxine) in guava leaves can prevent hair loss and promote its growth. Guava Leaves are rich in vitamin B which boosts hair growth and health. Guava leaves contain vitamins B3, B5 and B6 which make your skin look radiant and vitamin B2 which is responsible for the cell and tissue repair. These leaves can prevent hair fall when regularly used as a part of your hair care regimen. These leaves can also cure multiple health ailments just by using their Tea or chewing them directly or even by making a paste out of them. Take handful of guava leaves and boil them in 1 litre water for 20 minutes. Apply the remaining Guava Leaves Tea to your scalp, from root of hair till the tip, with more concentration at roots. Wash hair with a mild herbal shampoo after 2 hours. Repeating this once a week will strengthen hair roots and also make them appear shiny. It also delays greying. Guava leaves tea or syrup can help regulate blood sugar, preventing diabetes. Their high fiber content and inhibiting the conversion of complex carbohydrates into sugar, guava leaves tea can help lose weight quickly. Guava leaves extract effectively reduce triglycerides (fat) and low-density lipoproteins (LDL cholesterol) and increase high-density lipoproteins (“good” cholesterol). Lycopene content of guava leaves has been shown to inhibit the production the male hormone androgen, an over-abundance of which is responsible for some varieties of prostate cancer. Guava Leaves extract causes apoptosis (cell death) in stomach cancer cells. They promote digestive health, and are effective on treating diarrhea, food poisoning, and upset stomach. Guava leaves can be used for the treatment of diarrhea. Boil 30 grams of guava leaves with a handful of rice flour in 1-2 glasses of water and drink this concoction twice a day. Guava leaves contain anti-inflammatory qualities and therefore, can relieve toothache, heal gum and mouth sores and treat sore throats when used for gargling. Guava leaves can even be made into a natural paste at home for brushing the teeth and gums or can be chewed directly. Guava leaves prevent the release of histamine. The compounds found in guava leaves are effective in blocking all allergic reactions. The great healing properties of guava leaves can treat wounds, prevent infection and reduce inflammation of the uterus to accelerate the healing of wounds. Guava leaves tea can help in curing ear infections as well. Guava leaves are effective in treating acne and eliminating blackheads from the skin. They contain an antiseptic that can kill acne causing bacteria. Simply mash some guava leaves and apply it to the area. Then, rinse with water. This treatment can be done on a daily basis. Guava leaves contain allergy blocking compounds and are an instant cure for getting rid of itchiness.